Tuesday 31st August 1915: The Board of Agriculture has suggested that societies should be founded in villages to grow extra food during war time. Wherever possible vacant building plots, uncultivated “waste” land, and even common land should be used for co-operative food production or divided into individual plots. While it is expected that there will be plenty of expert local knowledge free leaflets on growing vegetables and fruit, keeping pigs, poultry and rabbits, and on bottling and preserving can be obtained from the Board of Agriculture and Fisheries. Goats can be housed and fed cheaply and provide wholesome milk; pigs can easily be reared cooperatively and would make good use of waste vegetable matter. Poultry are useful both for eggs and meat, and many people could easily keep a few birds. Rabbits could be bred and reared both for home consumption and for the market. The same applies to pigeons, which can be bred with the need for very little equipment – wire enclosures and pigeon cotes could be built by any man who is handy with tools and the birds need little attention. All matters of discipline will be dealt with by the forewoman, and any causes for complaint which a setter may have should be reported to the charge hand, and by him to the forewoman. In no suh cases should either the setter or the charge hand deal direct with the girls. The forewoman should, however, inform the charge hand of her proposed action in the matter, and hear his views before any action is taken. In the event of any girl displaying lack of care or want of effort on any operation, the setter must report her to the charge hand, who may himself speak to the girl and show here the right way to do the work. If, however, he wishes any action taken in the matter, such as the removal of the girl, he must himself report the matter to the forewoman, who will then take the matter up with the girl. The setters themselves have no other duty than setting the machines, and seeing that they are running properly. Beyond such brief instructions as is necessarily involved they are not expected to talk to the girls at all. All matters relating to the running of the shop, that is the actual operations in the shop, should be dealt with by the charge hand. In the event of his wishing to make any change in the girls on different machines, or deciding to run any section of the shop unusually late, he should first inform the forewoman and hear her views before any action is taken. This is only so that the forewoman may receive proper notification of any change that takes place, and may have an opportunity of pronouncing on the physical fitness of any girl for any particular operation. Apart from this, the forewoman has nothing whatever to do with the arrangement of the work or the allocation of the girls. 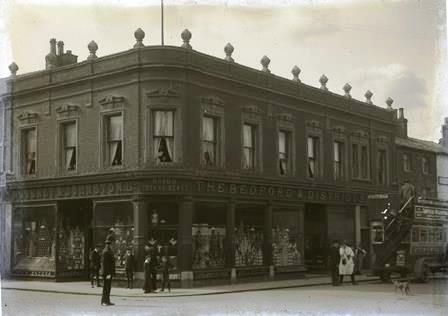 Sunday 29th August 1915: Since the previous Red Cross Hospital at the Corn Exchange in Leighton Buzzard closed last December the town has not had accommodation for troops requiring treatment due to illness or accident. A new Red Cross Hospital has now been set up in the Board Room of the Workhouse in Grovebury Road and is already providing treatment for soldiers at the Artillery Training School. Like its predecessor it is under the direction of the local Voluntary Aid Detachment, with Miss Blewitt as Commandant. The Board Room is light and airy and perfectly suited as a hospital ward. Any gifts of fruit, flowers, vegetables, rabbits, jam and so on would be gratefully received, at would the loan of bed rests and bed tables. Saturday 28th August 1915: For the second time in just two weeks an inquest has been held at Bedford into the tragic death of a young Welsh soldier. Gunner Robert Corfield of the Cardiganshire Battery of the 1/2nd Welsh Brigade, Royal Field Artillery was killed on Thursday morning while taking part in a routine drill. A fellow gunner, Hugh Alfred Hughes, described how he was riding on the firing battery wagon in a field on the Ampthill Road. Gunner Corfield was mounted properly on the gun but fell backwards off the gun limber and the wheel ran over his head. 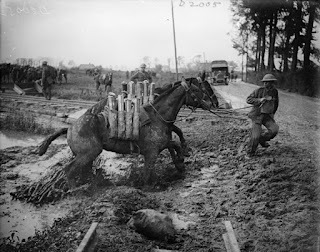 The man on the horse could not see Gunner Corfield fall, there was no time to shout to the driver, and it was impossible for the gun carriage to stop immediately. As far as he knew Gunner Corfield was a healthy young man but he could only think he must have become faint. Captain John Cook of the 2/1st Welsh Brigade Ambulance was in a field off Ampthill Road when he received a message that there had been an accident in the adjacent field. He found Gunner Corfield unconscious and bleeding profusely, but still alive. His jaw was fractured and there was a depression in the skull at the back. The cause of death was a fracture at the base of the skull. He thought it highly probably that the dead man was faint and overcome by the heat. Major J. C. Rey stated that he saw Gunner Corfield fall and also thought he was faint as there were plenty of opportunities for him to catch hold of something to stop his fall. He had known Corfield all his life and he was one of the best men he had. The jury returned a verdict of “Accidental death” and expressed their deepest sympathy with the man’s relatives. Gunner Corfield was 27 years old and had been a hairdresser before the war. His funeral will take place tomorrow in his home town of Aberwystwyth. The chief mourners will include his mother, three sisters and two brothers. Friday 27th August 1915: Canon William Wing Carew Baker, the Rector of Dunstable and his wife received a telegraph yesterday informing them that their son Captain Charles Tanqueray Baker had been killed in action with the 1/5th Bedfordshires at Gallipoli on 15th August. There were rumours in the town on Wednesday that Captain Baker had fallen, but until the arrival of the telegram yesterday afternoon the Rector had been hoping that the lack of official news meant this was no more than rumour. However, our well-informed man in the Dardanelles reported on his death just the day after the attack by the Yellow Devils on Kidney Hill at Suvla Bay. Charles Tanqueray was the second son of Canon Baker and at only 22 years old was one of the youngest captains in the army. He had been a chorister at New College, Oxford and had attended Fettes College in Edinburgh. After finishing his education he became a master at St. Ninian’s School in Moffat, Scotland until the war began. He joined the territorials of the 1/5th Bedfordshire Regiment in 1913, was promoted to second-lieutenant within a year, to lieutenant shortly after mobilisation, and to captain last autumn. He was in command of B Company when he fell. Canon Baker himself is chaplain to the 5th Bedfords. He wished to go out with the Battalion in that role but the Bishop would not give consent due to the importance of his work at home. 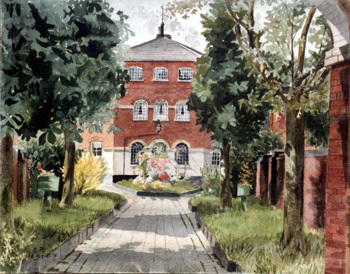 Captain Baker’s eldest sister is the commandant of the Red Cross Hospital at Houghton Regis, and another sister has recently left her nursing duties there to become probationer nurse at St. Bartholomew’s Hospital in London. Although he is over fifty, Canon Baker’s brother is serving in the Australian Forces and has been wounded twice at Gallipoli. Sadly Canon Baker’s hope that his brother and son would meet and the uncle would be obliged to salute the nephew never came to fruition. To England, which I’ll conquer! Are ready in their trench. Tho’ mad William says “they must”. Each one who can must pay. Why, try and get the best. The price must be reduced. – W.D. 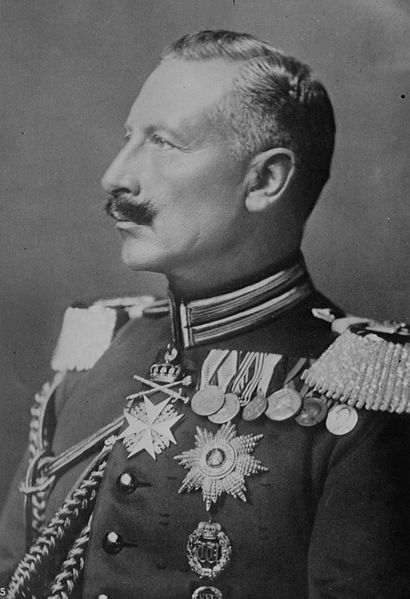 Field Marshal Sir John French. 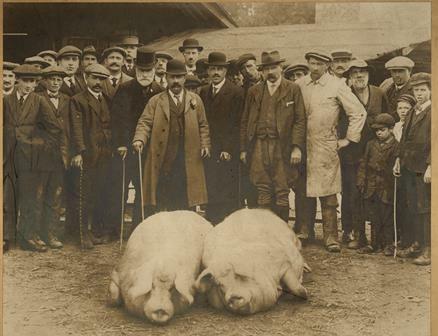 Roberts & Wilson, brewers of Ivinghoe (taken over by Benskins in 1927). Wednesday 25th August 1915: The harvest in the east of the county has been hampered by the extremely wet weather of the first half of the month. Over the past week the weather has changed for the better and it has been possible to bring in some of the wheat. If the good spell lasts until the end of the week almost all the wheat and oats should be harvested. The heavy rains of the weekend of 14th and 15th August caused a blight on the potato crop. Whole fields are now black, withered and malodorous, instead of a healthy green. The root crops have thrived in the rain and are now looking splendid. Market gardeners and smallholders are finding it difficult to sell their produce for a reasonable price. Bean pickers are being sent home because the price of kidney beans does not cover the cost of picking them, and marrows are unsaleable with some growers have been offered only one penny per dozen. The effect of the war on rail transport has meant that many have been thrown away because the Railway Companies were not able to get them to the destination at which they were required. There has also been a big drop in the price of wheat. Tuesday 24th August 1915: The annual general meeting of Luton Town Football Club was held last night at Mr. T. Keens offices in King Street – the usual arrangement of holding the AGM at the Corn Exchange with a public meeting to follow had to be abandoned due to the war. It was felt that last season had gone as well as could be expected in the circumstances. The number of soldiers billeted in the town had saved the club financially and the playing results were satisfactory. 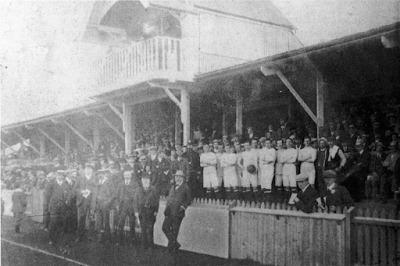 Expenses had been higher than the previous season due to their success on the pitch in 1913/14 when they won promotion back to the First Division of the Southern League. This had meant they signed on most of their players and had to pay them over the summer – the penalty of success! Unfortunately the situation for the 1915/16 season was very uncertain. 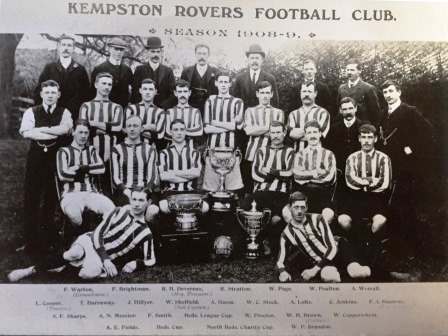 The club had been badly treated by the London clubs of the Southern League and as a result was being left out of competitive football for the forthcoming season. The directors had not yet been able to decide whether or not they should continue to play friendly matches, or whether to let the fixture list slide for the time being. Monday 23rd August 1915: Private W. Wildman of the 5th Bedfords Supernumerary Company has made an unusual discovery at Sharnbrook. He has found a mushroom of extraordinary size. This fantastic fungus measures no less than fifteen inches across, has a diameter of 37¼ inches, and weighs a hefty 1 pound 11 ounces. “As usual I am O.K. and enjoying life immensely, though of course one would like to have a run home more often, and would like to feel that others were not worrying. Worry? Well of course one cannot say there is no danger, but though I have been through fairly heavy shell fire while visiting the Salient some time ago, still I have never felt like being pipped, to use common parlance, and others who have done likewise have all returned safely. No name or means of identification is given. Saturday 21st August 1915: The effects of the demon drink have been in evidence at the Luton Borough Sessions this morning. George Darker from Birmingham was charged with stealing a motorcycle worth £20 on June 16th from the Midland Railway Station at Luton. The theft was reported on June 22nd by army officer Lieutenant Neale. Darker was arrested on Friday at Bedwell near Coventry and the motorcycle was recovered from Handsworth, near Birmingham. Darker appeared distressed, claiming “it was only through drink” that he did it, and saying he would like to get back into the Army where he had been a farrier’s sergeant. He was remanded in custody until tomorrow as a witness was needed from Birmingham. 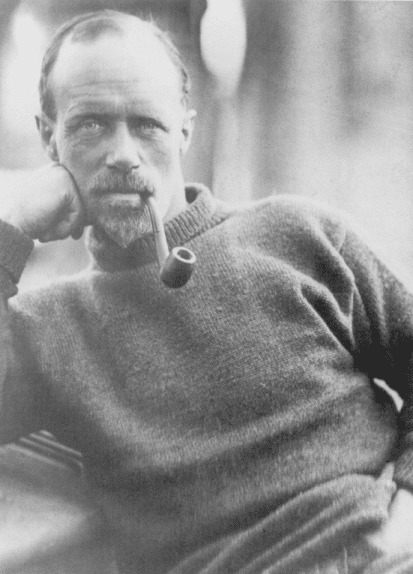 Friday 20th August 1915: The funeral has been held today at Eversholt Church of Mr. Benjamin Wild, father of the well-known Antarctic explorer Frank Wild. Mr. Wild served as the village schoolmaster at Eversholt for 23 years. He was a great enthusiast for amateur theatricals and together with his large family of eight sons and three daughters the schoolchildren were trained to take part in many social entertainments. Mr. Wild also served as Clerk to the Eversholt Parochial Charity for many years. 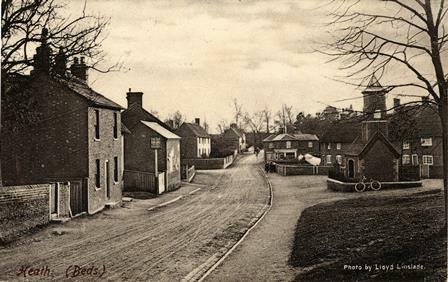 He retired from his post as schoolmaster several years ago due to ill health and moved to Flitwick before taking over a newsagent’s business at the Clockhouse at Ampthill. On his retirement from the school every pupil was given an illuminated card inscribed with a Biblical quotation from Proverbs. After Mrs. Wild’s death five years ago Mr. Wild retired for a second time and went to live with a married daughter at Wood Green. His son Frank has visited the Antarctic three times and is now there as part of Sir Ernest Shackleton’s Trans-Antarctic expedition. A second son, Eustace Wild, went out to South Africa with the Army Service Corps and died there of enteric fever. Three other sons – Laurance, Percy, and Stanley - are serving in the Forces. All three attended the funeral along with a fourth brother and their three sisters. Laurance Wild wore a sling on a wounded arm; his brother Stanley has also been wounded. Wild was second-in-command on Shackleton's epic Trans-Antarctic Expedition of 1914-1916. At the time of Wild's father's death in August 1915 the party's ship Endurance was trapped in pack ice. It subsequently sank, stranding the explorers. The group reached remote Elephant Island in April 1916 where Wild was left in charge while Shackleton and a handful of men sailed to South Georgia to raise the alarm. Wild and his men were finally rescued on 30 August 1916. 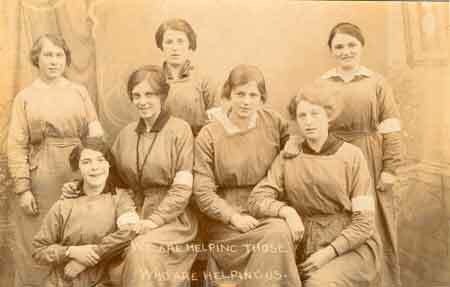 Thursday 19th August 1915: The effort to collect NationalRegistration Forms continues. In Bedford fifty enumerators have been carrying out the task. Each enumerator has to enter in a book the name, address and gender of each person who has received a form, and the dates on which they were delivered and collected. No cases of attempted evasion have been reported so far, although a handful of individuals were determined to deliver their own forms directly to the Town Hall. A surprisingly large number of people were visiting Bedford just for the weekend. Many of these had to apply for forms locally as many officials elsewhere in the country refused to give them out to anyone who was expecting to be away from home. The registration office was kept open on Sunday afternoon for their benefit. Once the forms have been received they are taken to the Town Hall where about a dozen volunteers are helping with the preliminary processing. The duties involved in compiling the Register include counting the forms for both men and women, checking the books, preparing summary and totals, transmitting the forms of non-residents to other areas, classifying primary occupations, making out certificates of registration, and recording secondary occupations. The final result will be separate registers for males and females in alphabetical order of occupations. Forms for men aged between 18 and 40 will be copied and sent to the O.C. Regimental Depot. 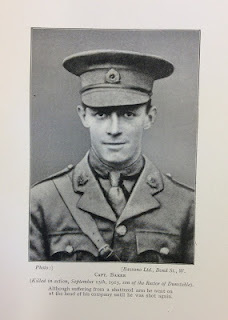 Wednesday 18th August 1915: Frank Crowsley, the son of Mr. James Crowsley of Tempsford Street, Kempston has written from India to say that he has been commissioned as a Lieutenant in the Somerset Light Infantry, making him the first Kempston boy to receive this honour. Before joining the Army he was well known as outside-left for Kempston Rovers F.C. He writes that when he first left home in 1908 he was a lance-corporal and hopeful that he would soon be promoted to corporal. However, a new draft from the 1st Battalion joined his unit in Malta bringing with it a number of more senior lance-corporals; as a result his promotion did not come through until 1910. After three years in Malta he was sent to China where he was posted throughout the Chinese Revolution of 1911-12, though without ever being called upon for a ‘scrap’. He was promoted to Lance-Sergeant shortly before leaving China for India in October 1913, then to Sergeant in February 1914, and last June he heard that he was to be a Second-Lieutenant. 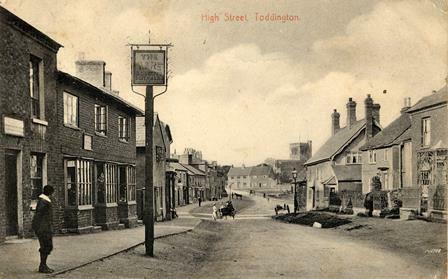 Monday 16th August 1915: Harry Brown, a dealer from Toddington, and his wife Mary have have been fined £1 each for being drunk and disorderly at Toddington. Police Sergeant Dennis gave evidence that he was called to Gas Street in Toddington where the Browns were both drunk and using disgusting language. Harry Brown was naked apart from his trousers and boots. He got them indoors, but they then appeared at a bedroom window from where they were swearing for about twenty minutes. P.S. Dennis was called back to the street and found Brown and his wife fighting, with a large crowd around them. They refused to go away so he had taken them to Woburn Police Station with the help of Special Constable Joseph Neal, a butcher of Toddington. Neal told the court that the couple continued to use filthy language all the way to Woburn. Inspector Vincent said that while at the Police Station they denied they were drunk and asked to see a doctor; the doctor certified that they were indeed drunk. Mr. Brown said he was upset because he had been called a German and he was as British as any of the magistrates. He was a traveller and had never been in trouble before. 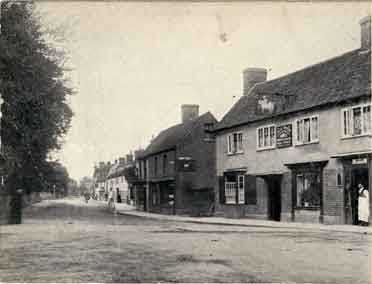 He had lived in Toddington for 12 months, had always paid his way, and tried to live respectably. He asked the magistrates how they would like to be called Germans if they weren’t, and dirty Germans at that. The couple’s fines were taken from £3 which had been deposited as bail. Mr. Brown said he did not want the balance and the police could put it in the Poor Box; Mrs. Brown, however, withdrew the balance. Sunday 15th August 1915: Lieutenant-Colonel Maunsell Bowers and his wife Catherine of Beeston Grange, Sandy heard this morning that their son Captain Arthur Hugh Mansell Bowers had been killed. They received news on Friday that he was wounded and missing, and their worst fears have now been confirmed. Captain Bowers joined the 1st Durham Light Infantry in 1900 after leaving Sandhurst. He served in South Africa from 1900-1902, winning the Queen’s Medal with two clasps and the King’s Medal, and in India from 1902-1908. He transferred to the 2nd Durham Light Infantry and went to France with the Expeditionary Force in September 1914. It is believed he was killed at Hooge on Monday 9th August. Thirty five year old Captain Bowers leaves a widow and two small daughters. He has been described as “an exceedingly affable and nice gentleman” and his loss has aroused great sympathy in Sandy for his family. A memorial service will be held at Sandy Parish Church on Friday evening. Saturday 14th August 1915: The Coroner’s Court at Bedford heard today how one of the Welsh soldiers billeted at Bedford lost his life in a tragic accident. 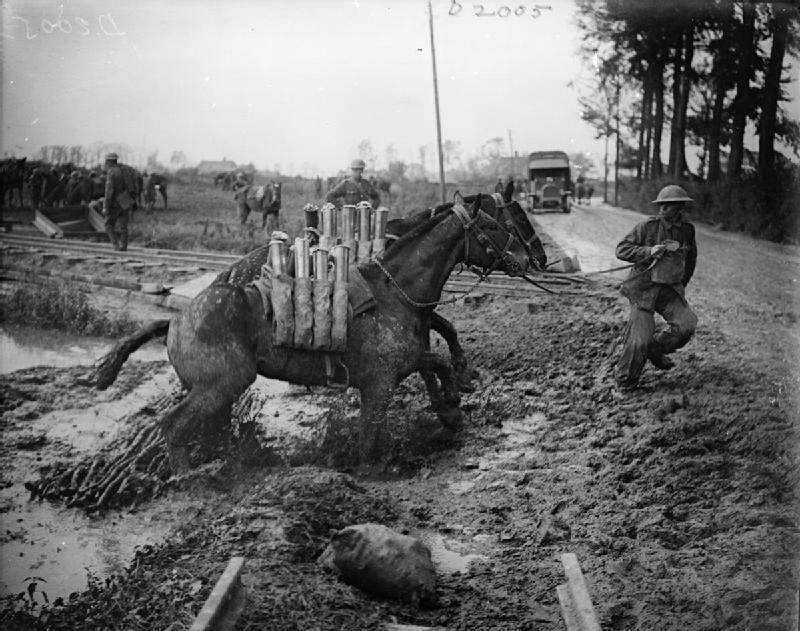 Driver John Rice Jones of the Welsh Divisional Ammunition Column was badly kicked while grooming a mule on Friday August 6th and was admitted to the Bedford County Hospital. The House Surgeon, Dr. Spense, was away when Jones was admitted; when he first saw him on Sunday night the young man was suffering from general peritonitis as a consequence of a ruptured intestine. This led to the eighteen year old soldier's death on Thursday. Lieutenant Godfrey Parsons of Driver Jones’ section was on duty on August 6th and watched as his men groomed some of the mules. The mules were tied to trees due to their viciousness - or, he said, perhaps nervous would be a better term, it was the nature of mules which were far more difficult to manage than horses. Jones had been a groom and had considerable experience of horses. He saw the mule kick Jones, who staggered and fell down. Lieutenant Parsons examined him, found a wound over the abdomen and sent for a doctor. Mary Jones, the young man’s mother, said that she last saw her son a fortnight ago, when he left home after a leave of absence. He had joined the Territorials because he was anxious to join the Army. She is a widow, and he was her only son. The Coroner said it was an extremely said case, and that the lad had joined the Army under age out of patriotism. The boy had done his duty, had died in a noble cause, and his life had not been lived in vain. The jury returned a verdict of “accidental death”. 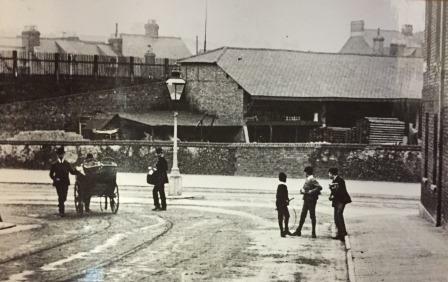 Driver Jones’ body was conveyed from the Hospital to the railway station on a gun-carriage this morning and sent by train to Newport, Monmouthshire for burial. Friday 13th August 1915: One of the Belgian refugees in Luton, Monsieur Clottens, has received a visit from his brother Joseph Clottens who is on leave from his work as assistant surgeon for the Belgian Red Cross at Calais. At the beginning of the war Joseph Clottens attended wounded soldiers at Antwerp. He was taken prisoner and interned by the Germans with other doctors and with officers from Britain, France and Russia. The barracks at Heidelburg were far too small for the numbers sent there and seven men had to share each small cell; the food was atrocious in both quantity and quality. M. Clottens was released in an exchange of prisoners and returned to his work as a surgeon. He has expressed himself delighted with the reception he has received in Luton where his brother now works at Kent’s. Thursday 12th August 1915: Messrs. Dudeney and Johnston of Bedford have been making special “Dujon” bread to send to prisoners of war. This bread has become so popular that large quantities are being dispatched five days a week. A number of local ladies have kindly volunteered to help pack the bread into parcels. Wednesday 11th August 1915: Wounded soldiers have been helping with hay-making on a farm near Bedford as part of their recovery. They enjoyed their time working in the fields, finding the task of helping with the hay a welcome interlude. One of the men in the photograph above was a convalescent from the Home Army and has now left for the Dardanelles, another had spent months in hospital recovering from frostbite, a third had been gassed, and the other two had both been wounded in the arm. Tuesday 10th August 1915: A tremendous storm hit Luton this afternoon with thunder, lightning and torrential rain lasting over half an hour. The New Bedford Road was flooded from Mill Street to Alma Street, with water a foot deep under the Great Northern Railway bridge. Storm water rose up through the manholes, lifting the cover off one which became wedged under the base of a tram and was dragged along by the vehicle. There was more flooding at the corner of Old Bedford Road and Mill Street, in the lower part of Church Street and elsewhere. Fortunately the new storm water system for the Dunstable Road district has recently been completed and that are escaped the flood. The River Lea has overflowed onto the Moor and has reached the top of some of the bridges. Houses have been inundated with water in Russell Street, Upper Wellington Street, and Leagrave Road, causing damage to furniture, and water is being pumped out of warehouse basements in John Street. Nearly the entire moulding shop at the Davis Gas Stove Company in Dallow Road, which covers an area of three acres, is under water and work has been stopped, causing considerable delay and expense. The house of Mr. C. Stokes at 104 Albert Road was struck by lighning; bricks from the chimneys fell into the kitchen and sitting room hearths, but nobody was injured. Monday 9th August 1915: Most of the men who went to France with the first Expeditionary Force last August are now being given leave. 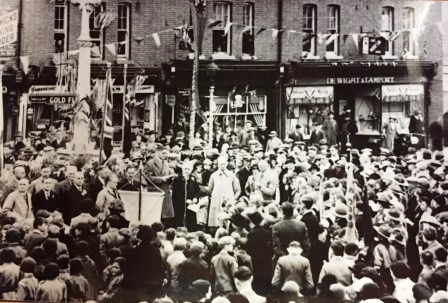 There was surprise and celebration in Thomas Street, Heath and Reach this afternoon when Private Horace Pratt of the 1st Norfolk Regiment arrived home for a well-earned rest. When war was declared Private Pratt was with his regiment in Belfast but within days the 1st Norfolks were sent to France. He took part in the retreat from Mons about which he says “We were only five thousand strong, and it seemed as though we were up against the whole German Army”. Since then Private Pratt has been in and out of the trenches but surprisingly after a year at the Front has not seen any hand to hand fighting. He was close to Hill 60 and saw the German fortifications blown up and the valiant British charge but took no part in the fighting himself. 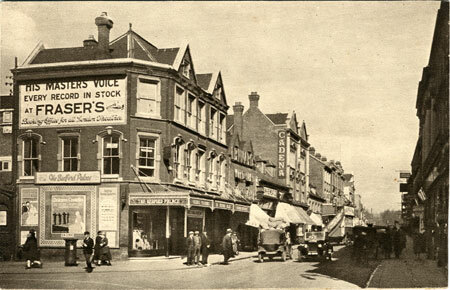 Sunday 8th August 1915: Private Arthur Humphreys has written to his wife at 6 Tavistock Street, Dunstable describing two aeroplane duels he witnessed recently, from each of which the British pilot emerged victorious. In the first of these a German plane was scouting along British lines when a small British aircraft appeared and dived at him. The British pilot fired at the German, setting his plane on fire and causing the stricken aircraft to overturn. One man fell from the cockpit from a height of 500 feet. The pilot managed to return control and bring his plane down to a lower height but it dropped and he was burned to death. In the second fight a larger British plane was over the German lines when it was attacked by a higher flying German. The British pilot avoided the attack and launched an attack of his own, from which the German plane fled. Private Humphreys, who is serving with the 1/5th Lincolns, is now in a base hospital at the Front with a wounded thigh. Coincidentally his brother Alfred, a lance-corporal in the 9th Lancers, also suffered a thigh wound at Ypres, with shrapnel so deeply embedded that it remains in his leg. He is now drilling recruits at Chigworth. Saturday 7th August 1915: Bedford has enjoyed some splendid entertainment this week. At the Royal County Theatre Mr. E Graham Falcon has presented a variety program twice nightly. The principal item on the bill was a new revue burlesque, “Beauty Baths” by George Ray which included some novel scenes; The Professor gave a lecture on “Husbands”, illustrated by a map; Ted Mercell, an acrobatic skate dancer demonstrated the art of falling on roller skates, to the delight of his audience; Miss Mollie Drew gave a charming rendition of “Annie Laurie”; and Mr. Harvie strolled around on a tightrope. The Empire was crowded on Monday night for a program of pictures. The four films included an exciting railway film, a story of American police life, and two topical pictures on “The floating peril” and “Lord Charles Beresford in France”. The films were followed by a stage show starring Phyll and Joe lipton in their burlesque “Seaside Appearances” which is said to be “as bright, breezy and bracing as the seaside itself”. Last night’s film programme included Charlie Chaplin in “Charlie and the Tramp”; the second house was a boxing contest between Gunner Sam Boswell of the Royal Field Artillery and Private Cook of the 1st Monmouths. At the Picturedrome Monday’s programme was given to a packed house. This entertainment included “The Morals of Marcus” a play by William J. Lock with the lead role played by actress Marica Doro, a humorous film, and the song “Your daddy was a soldier” played on the Vivaphone. This theatre is now showing “Tilley’s Punctured Romance”, starring Charlie Chaplin, Mabel Normand, and Marie Dressler. Films shown at the Palace this week have included the thrilling adventures of a gipsy king and his daughter in “The Fangs of Hate”, and the comedy “Pimple’s Peril”. The Palace Orchestra plays every evening, and the Pathé Gazette has provided the audience with interesting scenes concerning the war. 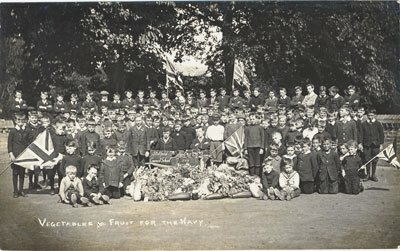 Friday 6th August 1915: The residents of Stotfold have been making their own contributions to the war effort. A meeting of the Hospital Demonstration Committee was held on Wednesday at the Church Schools to allocate the money collected at a demonstration held a few weeks ago. The decision was taken to send £12 to Hitchin Hospital, £2 2s. to Bedford Hospital, £2 2s to Addenbrooke’s Hospital at Cambridge, £1 1s to the Beau Site Convalescent Home at Hastings, and £1 1s to the Convalescent Home at Hunstanton. The Honorable Secretary of the Hospital Fund thanks all those who contributed and those who worked hard to make the demonstration such a success. Special thanks were due to the gentlemen who made and gave collecting boxes, to those who used the boxes to collect money, and to the ladies and gentlemen who decorated vehicles and cycles for the procession. “Dear Connie, All my mates join me in thanking you for your kindness in sending us some rhubarb. We did enjoy it. The cook got some custard powder and made us stewed rhubarb and custard, so you see we had a fine turn-out, and there wasn’t a bit left. It is nice to know that while we are out on the North Sea, sweeping for those dreadful mines, you are thinking about us at home, and doing your little bit to make our lives brighter and more happy. You may rest comfortably at home; the Germans won’t come for you while there are stout hearts and strong arms waiting here for them. I hope you remember us in your prayers at bedtime. I think I can rely on you doing that. You must be a sweet young lady to think about the sailors as you do. Thursday 5th August 1915: An inquest has been held into a tragic accident which took place at 17 Inkerman Street, Luton where Charles Hollingsworth Reading lived with his wife and her parents. A visit from relative had caused the occupants to arrange makeshift sleeping arrangements, with Reading sleeping by himself on a mattress in the back bedroom. A loud crash was heard during the night and Reading was found to have fallen downstairs. No doctor was called until the morning as his injuries did not seem serious. Grace Reading gave evidence that her husband was in very good health. A couple of weeks ago she had found him walking round the bedroom while apparently still asleep. He tried to open the bedroom door but failed and went back to bed. He had also walked in his sleep once last year. On Sunday night they all went to bed about 10.30pm. She was not called when the accident happened as she had not been well. Mrs. Reading’s father, George Summerfield, had slept downstairs on the couch that night. At about 11.45pm he heard a thud, went to the stairs and called up to ask what was the matter. He did not at first notice Mr. Reading lying on his back at the foot of the stairs. When he saw him he called one of the guests, Horace Inwards, and they put Mr. Reading on the couch. He appeared to be sound asleep and snoring heavily. Just before seven Mr. Summerfield went for the doctor, at which time Mr. Reading was still alive and still appeared asleep. Someone was with Mr. Reading at all times and he believed he had come round. Horace Inwards agreed that Mr. Reading was snoring heavily when put on the couch. He could find no broken bones and did not think there was any serious injury. They had bathed the man’s head with cold water, but he never regained consciousness. When Dr. Harmer arrived at the house early on Monday morning he found Mr. Reading dead. There were no marks on his body but there was a haemorrhage from his right ear. He believed Mr. Reading died from a fracture to the base of the skull. The Coroner thought there could be no doubt that sleepwalking was the cause of the accident and the jury returned a verdict of accidental death. Before the meeting a service of intercession is to be held in St. Barnabas Church. The Recreation Ground is being decorated with patriotic flags in preparation for the event. Prynne: Have you ever heard [Reeve] threaten his wife? Flemming: Yes, two or three times. Prynne: What was the nature of the threat? 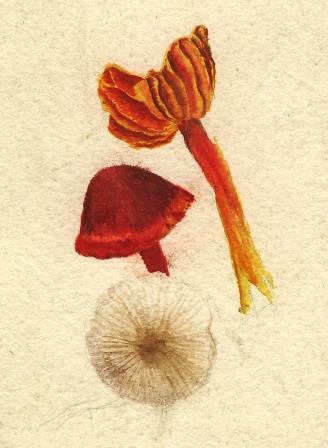 Prynne: When did he last threaten her? Flemming: In June, when I was sleeping at his house. Prynne: Did you ever see him strike her? Prynne: Or say how he was going to kill her? Prynne: What did he say? Prynne: Did he go for the gun then? Flemming: I don’t know, I was upstairs. Reeve spent the hearing sitting on a chair near the dock with his head in his hands, looking up with a worn and haggard face only while his son was giving evidence. 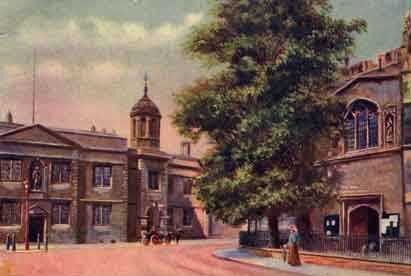 After a hearing lasting over three hours Reeve was sent for trial at the Bedfordshire Assizes. If found guilty, there can only be one penalty: death. Monday 2nd August 1915: An accident which could easily have had tragic consquences occurred in Shortmead Street, Biggleswade this morning. The horses pulling a transport wagon belonging to the Signal Section Royal Engineers ran away from elsewhere in the town and bolted down Shortmead Street. A cart belonging to Mr. Humphreys, a carrier from Northill, was standing outside Messrs. Woodall and Co.’s premises with Mr. Humphreys’ son inside. As the wagon passed the cart the horses and pole separated from it. The wagon caught the cart, totally wrecking it; the boy inside was extremely fortunate to escaping injury. After hitting the cart the wagon ran on a few more yards, wheeled round and crashed into the bay window and glass door of Mr. W. Marsh’s house. Damage estimated at £6.10s was caused both to the window and door and to a quantity of antique china. Two little boys who were sitting on the doorstep had a miraculous escape. One suffered a slight injury to his foot and the other a grazed face. The horses ran on down the street until one fell near the Bridge, after which they were both secured. The wagon was only slightly damaged. This was the second incident in the same area in three days. On Saturday an army van was being turned nearby at such a speed that the horses ran into the iron fence and hedge of Mrs. Pope’s house. The horses’ heads and legs together with the van pole were shot up into the air above the hedge and fence. It took about a dozen men to rescue the horses and get them and the van back into position. They went on their way apparently none the worse for the escapade. The scaled down Sunday School Treat took place on July 14th. The attendance of around 300 was larger than last year and the showery weather did not dampen enthusiasm. Fortunately the Rectory grounds offer plenty of shelter, and sports, cricket and football were held between showers. 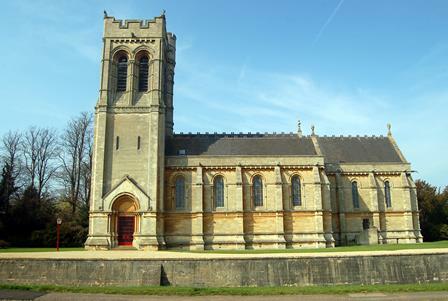 As suspected last month all railway excursions have had to be cancelled this year, but the probationary choir of the Parish Church were taken to Bedford on Saturday 17th July. The forty members of the Choir visited Woburn on Wednesday 21st July, stopping at Ampthill Park on the way where they watched the soldiers drill and perform a gymnastic display. The Park at Woburn was “a pretty picture, trees in their beauty, graceful deer of all descriptions, emus, birds and the bushy squirrel”. After tea there was a visit to Woburn Church and a return trip by way of Eversholt and a visit to the Manor gardens at Westoning. On Sunday evening July 4th a violent thunderstorm passed over the village while the sermon was being given at the Methodist Chapel. Mrs Frank Fisher was seated between two open windows; the draught acted as a vehicle for the lightning, which struck the spectacles she held in her hand. These were snapped in two and hurled to the ground, and Mrs Fisher was paralysed down her left side. The Doctor believes that if she was wearing the glasses she would have been killed instantly. Fortunately Mrs Fisher is now on the road to recovery. We should all learn the lesson never to wear glasses during a storm and to close all windows. On Friday July 23rd a meeting was held in the schoolroom to promote the South Beds War Savings Campaign. It is important to remember that the German military machine cannot be defeated without money and that everyone, rich and poor, is able to help. Imagine what a large sum could be raised if everyone saved one penny a day – money that would be lent to the government at a good rate of interest. The War Loan was explained, and the audience were reminded that money invested could be withdrawn at any time by application to any Money order Office. Is was suggested that a large amount could be saved by following the King’s example in abstaining from drink. The Rector of Clophill, Reverend Cecil L. Matthews has left at short notice to join the troops as a chaplain. He says “I hope that when I go to the Front you will remember me, and the other Clophill men, in your prayers, and that God will send us the Victory in this awful war”. The village has seen a number of other departures. Bertie Webb and Herbert Young have joined the Mechanical Transport of the Army Service Corps; Trooper H. Gibson of the 5th Royal Irish Lancers, Corporal H. L. Cunnington of the 8th Battalion of the East Surrey Regiment, and Privates L. Ansell and E. Eddy of the Beds Territorials have all left for the Front. Also to the Corps Headquarters of the Royal Engineers who have been at Clophill since early February have left for the East. Relations between these “splendid fellows” and the village have been most cordial.